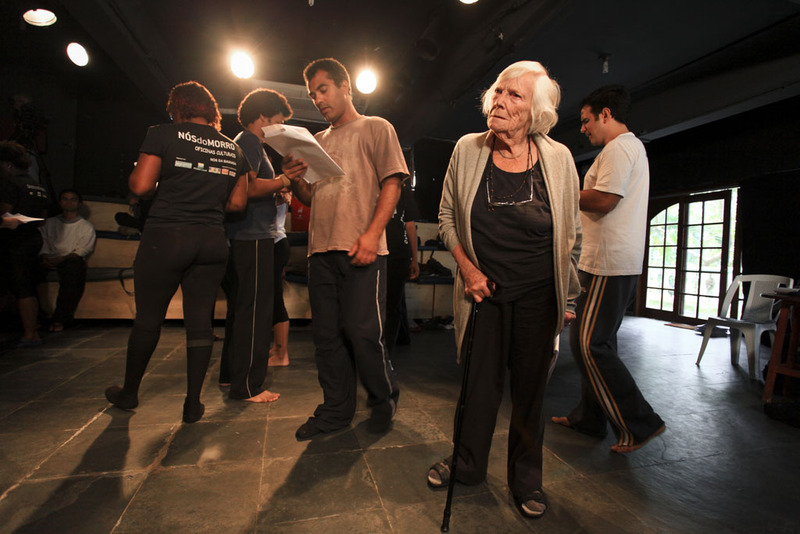 In her 87th year, Cicely Berry picks her way carefully down Salvador’s historic cobbled streets and is more cautious than other members of the RSC in trying the gastronomic delights of a Bahian restaurant, but she throws caution and her walking stick to one side when she enters the rehearsal room to begin her workshops at the Teatro Vila Velha for this year’s Fórum Shakespeare. It should be too darn’ hot to think of Shakespeare, but Cicely Berry’s passion for enabling actors to excite the audience with language and ideas burns stronger than the tropical heat. The rehearsal room sweats with the collective energy she releases in these young actors and directors. Participants have come from across Brazil to spend this week working with Cicely Berry, Justin Audibert and Michael Corbidge from the Royal Shakespeare Company in Salvador, Bahia. Together with Bridget Escolme from the Drama Department at QMUL, they are running workshops that fuse Bahia, Brazil and Britain into a rich Shakespearan moqueca. Every evening there are free public debates to follow the day’s workshops. On Tuesday night Cicely Berry discussed the theatrical engineering of Shakespeare’s texts with Marcus Barbosa – a young Brazilian playwright whose work can currently be seen in Feast at the Young Vic in London and has recently completed a new verse translation of Shakespeare’s Richard III. Last night, Bridget brought her academic wit and wisdom into dialogue with Elizabeth Ramos from the Federal University of Bahia and Celso Jr from the Federal University of Sergipe. As ever, People’s Palace Projects takes audiences to the heart and heat of the creative encounters between Britain and Brazil.